While the New Year blew in quietly weather-wise, in the last 2 weeks of January we have received some very wintry weather. Heavy falls of snow across two days last week blanketed the landscape in a thick white winter cloak. As quickly as it came, within 2 days it had melted and washed away in milder rain. 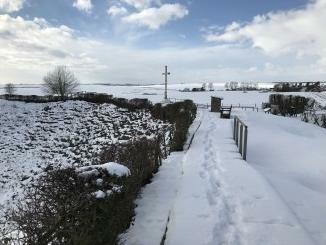 Then again on the night of 29th January, we had another very heavy fall of snow across all of Northern France. We woke to blue skies but everything eerily quiet as the thick snow once again muffled the normal sounds and lay like a rich ermine coat on all it came into contact with. More snow arrived the last day of January! 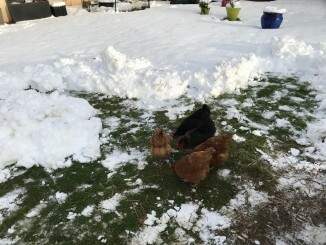 David each time has cleared our driveway and pavement aided by our neighbours and made paths through from the chicken coop to the rest of the garden, as the chickens don’t like to walk on snow! At least we come back to a warm house, tea, and safety after our walks. Time for another fanfare, as our winter renovations are complete, with new bathrooms, lighting, flooring etc. in all our guest rooms. It really has given everywhere a modern feel, without losing any of our cosiness! We look forward to sharing the refurbished No.fifty6 with you this year. Now that our works are finished several of our French friends (and Monsieur le Maire) suggested we hold an inauguration evening to celebrate the end of works. 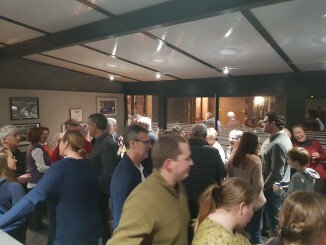 An inauguration evening is a French custom for a business to show what it has achieved and an opportunity to thank those who helped and of course have a very sociable evening to boot! 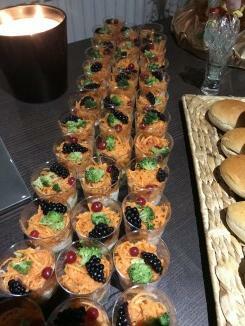 So on 26thJanuary we held an Inauguration Evening. About 45 invited friends and neighbours came along. Our wonderful French friend Isabelle and her daughters helped us organise it all from invitations, to catering to decorations. The evening passed in a blur of feelings of goodwill and friendship. David made his first public speech in French and the champagne flowed freely and there were plenty of wonderful canapés and yummy things for everyone to eat. 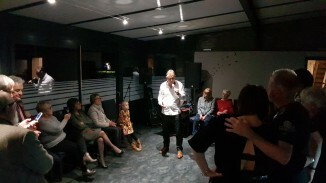 Our friend and amazing singer-songwriter Bruno Sauty played and sang for us and everyone remarked what a wonderful evening it was. We are so pleased we were able to thank our friends and local community for their support in helping us achieve our vision. The house now looks like a florist’s shop as we have been inundated with flowers, little gifts and we are aglow with a feeling of belonging in this little community. Vive No.fifty6!! 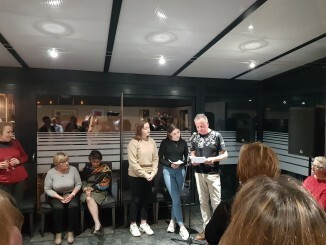 David makes his debut public speaking in French with our young French friends Juliette and Sacha translating into English! There is a tradition in France that every Commune gets together in January, when the Mayor presents his or her New Year wishes, “La Cérémonie des Vœux”. 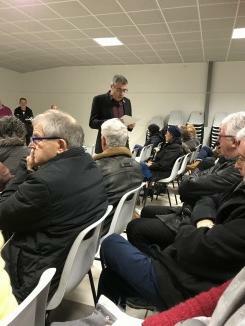 We attended our Voeux de Maire in the village hall on 25thJanuary. Christian our Mayor outlined local budgets, what works were planned for the year, welcomed newly installed families and acknowledged all who had decorated their roadside Christmas trees – no Ovillers La Boisselle pencils were awarded this year for the Christmas trees so we were deeply disappointed! In terms of works completed there is a new toilet block for the school and village hall (much needed) and a new picnic table on the green behind the Tyneside Seat. This year improvements to road safety with speed calming measures are planned as well as book exchange boxes in each village, landscaping the area around the pond in Ovillers and 2 petanque courts will be built. Then we shared in a glass of fizz and Epiphany Cake – Gallettes de Roi. It is a wonderful, community orientated way to start the year. 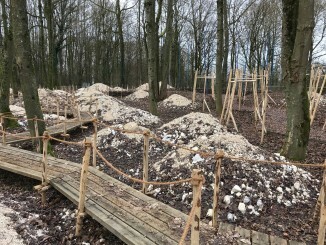 We had heard about a new Peace Garden and Walkway alongside Thiepval Memorial so this month we went to investigate. Just behind the Visitor’s Centre in the wooded area adjacent to the Memorial there is indeed a new area with English and Welsh inspired gardens. Seeing them in the winter and newly constructed it is hard to get a feel for what the gardens will be like through the growing seasons, but we did find these areas to be a place of quiet refection away from the Memorial itself. Definitely worth a look if you are visiting Thiepval. 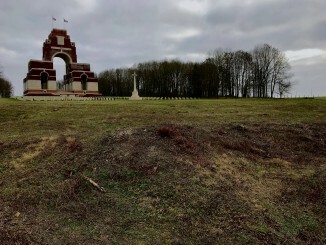 Also at Thiepval the area behind the Cemetery and Cross of Sacrifice has been cleared and it really is worth walking through the cleared area. You can clearly see the German Front Trench Line with it’s commanding position looking over Thiepval Wood. Grizabella the cat is very much at home and had a trip to the vet to be sterilized this month. She really is a little darling who has been such a good girl even when she was wobbly after the anesthetic and was sore for a few days. The stitches are now out and she is very content. The kittens, now quite big, still play outside and we feed them, but they will not come in the house. 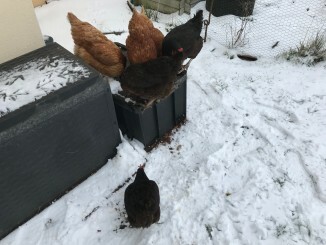 The chickens do not like the snow (David has to clear a snow-free play area for them so their feet don’t get cold) but are happy and healthy and still producing eggs – amazing in this cold weather. However, sad news has hit us at this month end. After a couple of days of being off colour, Mash the little white lion-head rabbit has not made it. We kept him cosy and warm but on Tuesday night he fell asleep and did not wake up. We are very sad and we will miss him. 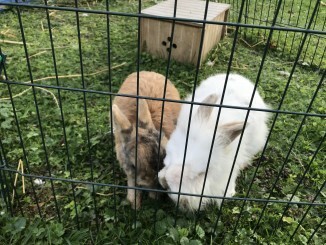 We are also worried about little Sausage, as although he is fine, we know he is going to miss his playmate terribly as they were always together. Rest in Peace little Mash, after making your little journey over the rainbow bridge. 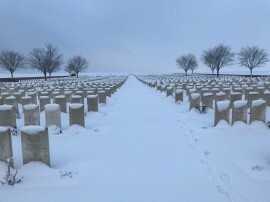 Happy new year to you both x. Thankyou once again for all the beautiful photos and updates of in and around the somme from NO56, looking forward to catching up with you both in the not to distant future x. Great start to the year for you both. keep the news letter coming. Well done David on your French initiation. Thanks for another great newsletter. Well done on the inauguration and David 'going solo'. Sorry to hear about Mash. I'm hoping to come to France (from South Africa) to visit my great uncle's grave at Villers Bretonneux and to stay at your wonderful B & B. Your newsletters keep me encouraged and motivated in the completion of my great uncle's biography - and for this, I thank you very much indeed. Thanks for sharing more updates. It's sad about your little rabbit but we can see your cat numbers increasing to three, if you are not very careful. 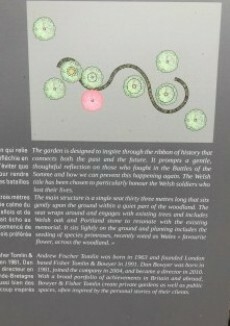 See you made it to the Thiepval Peace Garden ... I think you may have thought more of it than Malcolm & I ... haha/wink/wink. Thanks for the lovely posts of snow scenes ... beautiful. Another great newsletter - always looking forward to it. .Always poignant to compare you lovely living arrangements on the Somme to what the boys had to endure. Another interesting monthly post, loved the video's of the snow. 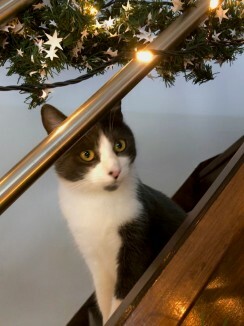 Sad news about little Mash.Hope to visit you again soon. Thank you so much for the Newsletter and greetings to you all from a snowy Sweden! I am really sorry about the loss of your rabbit. I know how hard it is to loose an animal friend. Mash the rabbit, may you rest in peace. Brilliant newsletter as always. Looking forward to seeing you again in July. Sorry to hear about your rabbit. Voici des larmes que je laisse tomber pour le petit Mash, Qu'il court, heureux ,près de Watership Down. Lovely update and written so well as to make you feel that you were there.